Wouldn’t it be nice to control absolutely everything? Actually no. Not really. Sometimes it’s best to trust your choices and let go after looking closely at well-collected data. 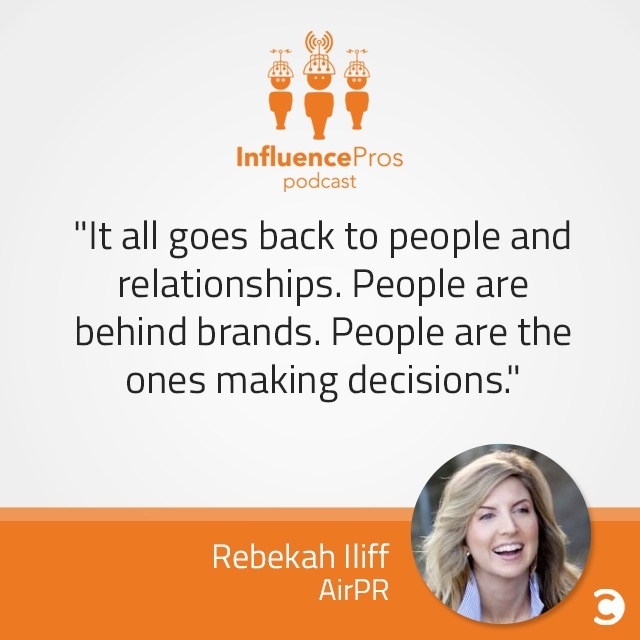 Rebekah Iliff is a powerhouse of energy, savvy, and wisdom after years in the PR business. She’s coined the term “PRTech,” and believes in using data wisely, consistently, and taking the time to find the specific influencer that suits your needs and letting them grow your message far beyond what your brand thought imaginable. Rebekah’s company, AirPR, is a PRTech company that provides, data, insights, and analytic solutions for the constantly developing PR industry, bringing actionable insights to all. She loves pushing the envelope and shares her ideas today on how businesses can create measurable programs with trusted influencer campaigns. Would you rather spend two weeks stuck in a psychiatric hospital or in an airport? I think that I would probably choose an airport, because I’ve been stranded at airports and as long as it’s a good one, I can totally handle it. Would you rather eat ghost peppers or have to perform CPR on a complete stranger? I’d have to say CPR on a stranger, for sure. Would you rather be a successful artist who sells uninspired commercial art that you see at chain hotels, or a starving but absolutely brilliant artist? Oh, definitely the second. Definitely the second. I can always make a buck so I think that I would definitely choose the second one. I would figure it out. I would figure it out at some point, but I would be miserable in every other thing.